In a previous posting 3D Printing: The Star Trek replicator is here?, I discovered 3D Printing, comparing it the replicator of Star Trek. I was so blown away by this technology and potentially how it could change our everyday lives, I have been scouring the Net for videos and other articles detailing the process. 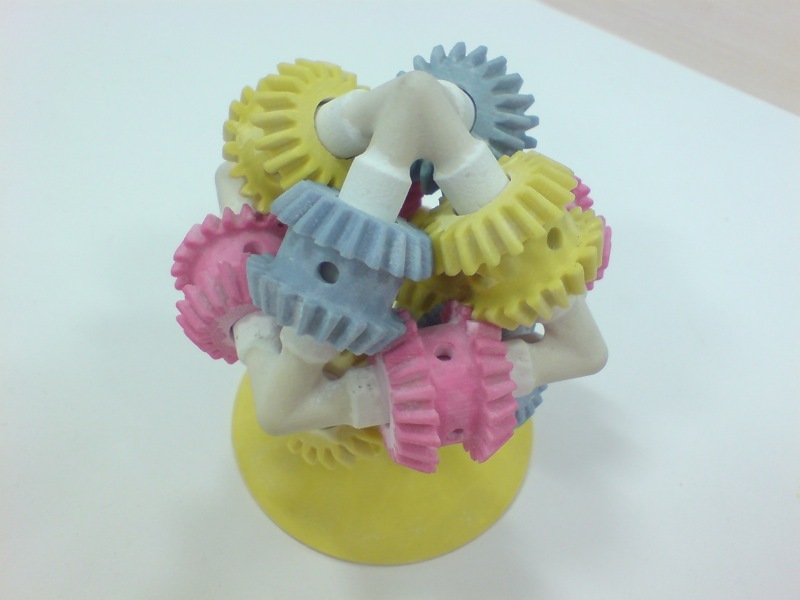 While the creation of an object is in itself startling, my research showed me examples of 3D Printing involving complex objects made up of components. Instead of creating a series of parts then putting the final product together, I could create, for instance, a mechanism consisting of a number of gears which all mesh correctly and interact when turned. At the moment, 3D Printing should probably be considered in its infancy but what it currently is capable of doing shows a lot of potential. 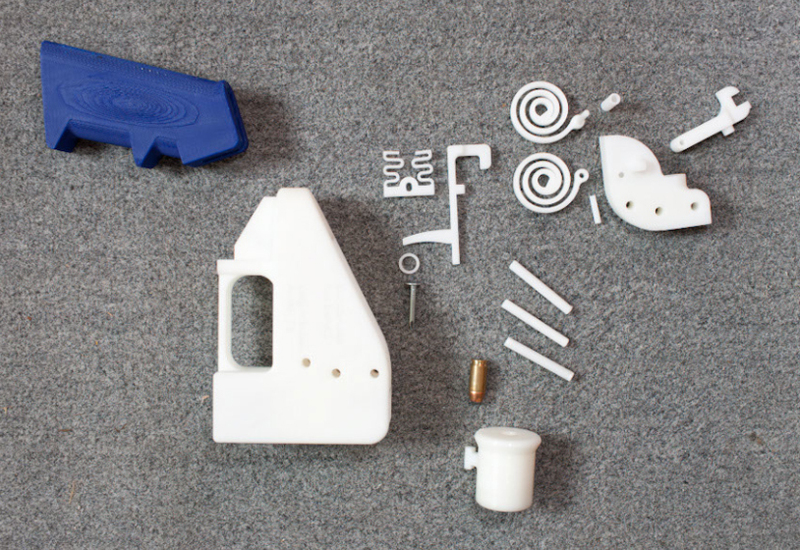 Cody Wilson of Defence Distributed published the specifications of this 3D gun. (Wikipedia) Named after a WWII gun, the FP-45 Liberator, the 3D files were apparently downloaded over a hundred thousand times before the U.S. government stepped in to investigate a violation of the gun laws and had Wilson remove the files from his web site. 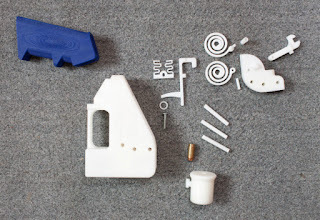 The following picture shows the various pieces making up the gun; all created using a 3D printer except a household nail used as the firing pin. And the bullet, of course. Is this dangerous? Cody Wilson himself in a television interview admitted there is always the potential of somebody using new technology to harm other people. But in the end, other analysts have pointed out the potential of good with 3D Printing far outweighs the bad. Whether it's 3D printing or just buying a gun on the street, somebody who wants to do harm is going to do harm. Will the ability to create a gun mean in the long run that statistically the number of shootings rises? Can it get any worse than it already is? Wow, wow, and more wow. My mind is going a mile a minute mulling this one over. Some prognosticators have talked about 3D Printing turning the manufacturing world on its head. Instead of me going out to the store and buying, let's say a wrench, I could go to the Internet, download a specifications file, and then make one right in my own home. Many people are familiar with the work of M.C. Escher. We have all learned to appreciate the impossibilities that this master of illusion's artwork presents to the layman's eye. Many of the so-called 'impossible' drawings of M. C. Escher can be realized as actual physical objects, Prof. Gershon Elber of Technion's Faculty of Computer Science has done just this. His research team has developed a unique CAD application for designing "impossible" 3D objects, with the 3D printer in Technion's Faculty of Architecture and Town Planning The Belvedere comes to life in a 3D model.